David is ratted out again by the Ziphites (1 Samuel 23:19-23) to Saul who takes 3000 men to the Desert of Ziph to find David. David goes with Abishai to Saul’s camp and finds Saul asleep. Abishai offers to kill Saul with one spear thrust. David again says no — that he cannot lay a hand on the Lord’s anointed and God will deal with him in His time. He takes the spear and the water jug near Saul’s head and departs. David tells the man guarding Saul he deserves death along with the rest of the men because they failed to protect the king. Saul wakes, and David once again asks why he is pursuing him. Again, we see almost a verbatim repetition of 1 Samuel 24. Saul says he was wrong; David doesn’t trust him; they go their separate ways. 9) This play out almost exactly like 1 Samuel 24. David spares Saul’s life, but he could have just as easily killed him. He probably recognized his harshness with Nabal. David could have gone the other way, but his faith was so strong he didn’t. 10) Same as in 1 Samuel 24. Abishai believes (like the mob in 1 Samuel 24) that God has handed Saul into David’s hands to end his life. David believes he is not to raise a hand against the Lord’s anointed, and thus refuses to do so. David has faith God will deal with Saul (the wicked) in His own time, and he doesn’t worry about it. 11) Part personal Question. My answer: God is faithful, and David’s faith in Saul is unshakeable. God is just as David knows God will deal with Saul. God protects as David knows he won’t be harmed by Saul. I need to remember all God’s truths better: He’s just, fair, merciful, and faithful. It’s interesting how Saul never gives up when he has to know the outcome. People are stubborn despite God knocking them on the head repeatedly. I love how David won’t kill Saul, but he makes sure to let Saul know he could have. Warnings can be good teaching points (except Saul never learns). The people of the city of Ziph – had betrayed David’s whereabouts to Saul before (1 Samuel 23:19-23). Now they try to gain King Saul’s favor again, by helping Saul find David again. 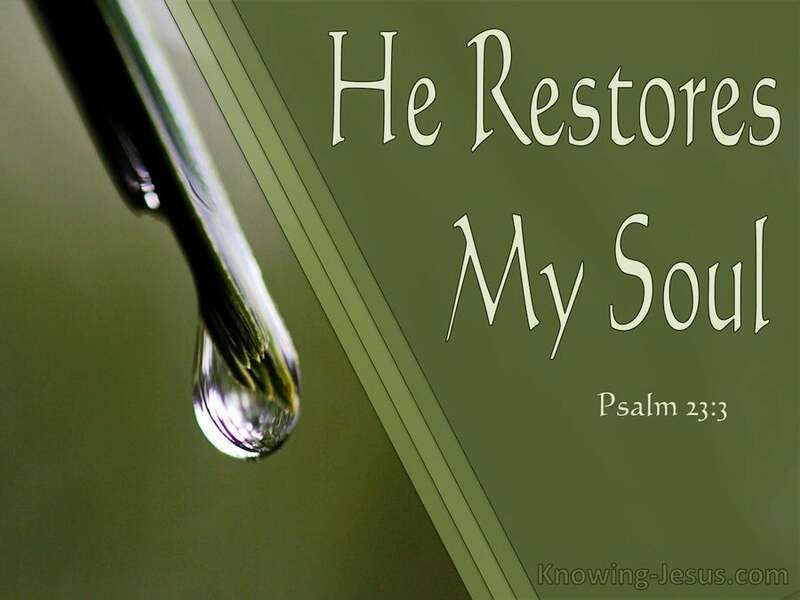 Saul goes back on his previous repentance (1 Samuel 24:16-21). At that time David had the opportunity to kill Saul but did not. When David boldly demonstrated this to Saul, the king was greatly moved emotionally and publicly repented for his murderous intentions toward David. Saul’s repentance was deep, sincere, and emotional – but it didn’t last very long as the same thing happens in this chapter. 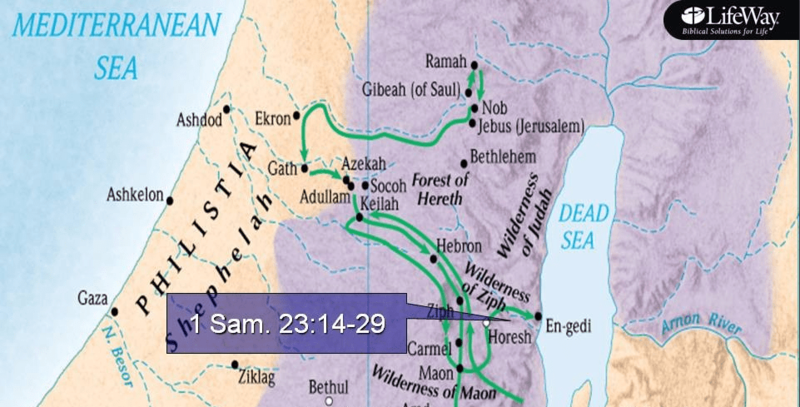 A a wise and capable commander David constantly monitored the movements of Saul. David knew where Saul was but Saul did not know where David was. The King James Version says that Saul lay within the trench. That translation is accurate from the Hebrew but gives the wrong idea. The perimeter of the Israeli army camp was marked by the tracks of their wagons, and it was within the perimeter of the camp that Saul slept. The last time David and Saul met David was simply hiding from Saul, and Saul happened upon the place where David hid. This time David actively sought Saul out. Why David not kill Saul a second time? The last time Saul was in this situation (1 Samuel 24), he was overcome with emotion. His feelings seemed right but his life was not changed (1 Samuel 24:16-21). This time there is something cold and mechanical about Saul’s words. FUN FACT: This will be the last time David sees Saul. Abigail got wind of David’s request and how good he had been to them, guarding the sheep. Abigail decides to give David food without telling Nabal. She rides out to greet them as David is still seething over Nabal’s denial of his food request and is preparing to slaughter Nabal’s men. Abigail prostrates herself before David, begging him to put the blame on her instead because her husband is a fool. She reasons with him to not kill them because then he’d have innocent bloodshed on his hands. David blesses her, saying she has saved him from killing all of Nabal’s men. Nabal dies. David marries Abigail. He had married Ahinoam of Jezreel as well but Michal had been given to another man. Don’t worry over evil people. 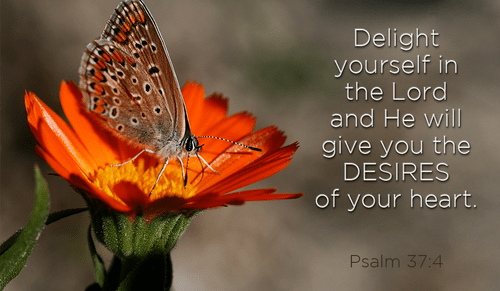 Trust in God and He will give you the desires of your heart. Wait for the Lord. Refrain from evil. The Lord laughs at the wicked. The wicked will vanish and perish. Do good and the Lord will not forsake you. He will bless you. 6) Part Personal Question. My answer: Abigail is intelligent and beautiful. She is selfless, willing to take on Nabal’s punishment. She cares for her employees to save them. She is humble, brave, and courageous. She is sacrificial. I’d like to be more caring, humble, and more sacrificial as well. 7) Part Personal Question. My answer: God sent Abigail to prevent David from doing something he’d regret and from sinning. Every day God extends mercy to me as I fail and am flippant with others, impatient, and mean sometimes. 8 ) Part personal question. My answer: God blesses the good and condemns the evil in His time. I need to be more patient with God and allow Him to give me the desires of my heart. Leave it to a woman to diffuse a male ego. Abigail, knowing something bad is going to happen, goes to David and makes peace. David realizes how wrong he was and then marries Abigail, probably recognizing her intelligence, courage, and selflessness. Nabal’s servants read the handwriting on the wall. They knew that David would not take such an insult (theft, actually) lying down. For their own sake and for the sake of the household. they asked Abigail to do something, knowing Nabal would not (Proverbs 17:12). The fact that Abigail was able to gather so much food so quickly shows how wealthy Nabal was. If this much food was on hand, it makes Nabal’s ungenerous reply to David all the worse. In his angry, agitated state, something unexpected made David and his whole company come to an immediate stop: a great procession of gifts, and at the head of that procession, a beautiful woman bowing down before David. This had to make a startling impression on David. What did Abigail do that saved her men? Abigail came as a humble servant, not as a superior (as the beautiful, rich, and privileged often do). What did Abigail do wrong in her interaction with David? Abigail was not outstandingly submissive or respectful to her husband, Nabal. Though there is no explanation in the Bible, perhaps Abigail’s behavior was justified because this was a life-or-death situation. If Abigail didn’t do what she did, then Nabal and scores of innocent men would die. But the point of the passage is how submissive and respectful Abigail is towards David, not Nabal. Abigail focused David’s attention from Nabal back to God who could easily kill all of David’s enemies with a sling, referencing Goliath here. Abigail lifted David up instead of beating him down. David was clearly in the wrong, and Abigail wanted to guide him into the right. But she didn’t do it by being negative, by emphasizing to David how wrong and angry and stupid he was – though in fact he was. Instead, Abigail emphasized David’s glorious calling and destiny, and the general integrity of his life, and simply asked him to consider if what his present course of action was consistent with that destiny and integrity. Abigail is a marvelous model of “sweetly speaking submission.” Many Christian wives have the idea of “silent submission.” They say, “I know my husband is wrong, but I won’t tell him. Submission means I should shut up.” That is wrong, and they should look to Abigail as an example. Other Christian wives have the idea of “sharply speaking submission.” They say, “I know my husband is wrong, and God has appointed me to tell him. And boy, will I!” That is wrong, and they should look to Abigail as an example. Abigail gives the right example – submission that speaks, but speaks sweetly instead of sharply. Abigail’s submission to Nabal was not outstanding but her submission to David was. And David’s submission to the Lord was equally outstanding; by giving up the fight, he had to trust God to take care of Nabal. What do we learn from Abigail? Our hurt feelings never justify disobedience. When others sin against us, we may feel justified in sinning against them, but we are never justified by disobeying. It is a great blessing when we are kept from sin. David knew God sent Abigail and was speaking through her. 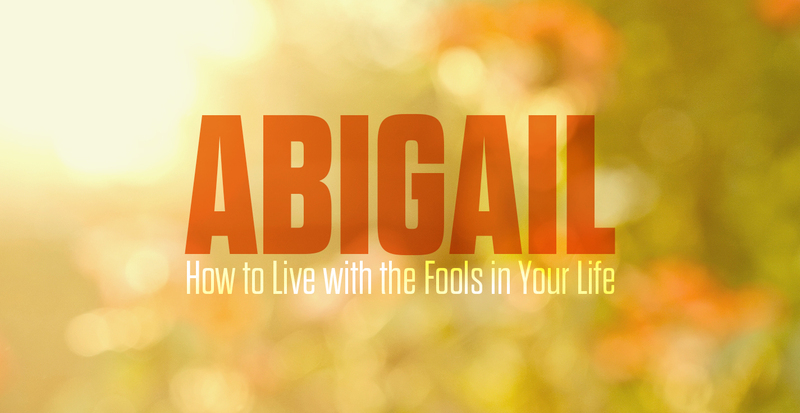 How many Abigails do we have in our lives? Abigail reminded David of his destiny – to reign over Israel in righteousness and integrity. If David had slaughtered Nabal and his household, it would forever be a black mark against David among Israelites. They would forever wonder if they could really trust him. It might also seal his doom before Saul, because for the first time David would have given Saul a legitimate reason to hunt him down as a criminal. Note Abigail also paid David what he was owed. 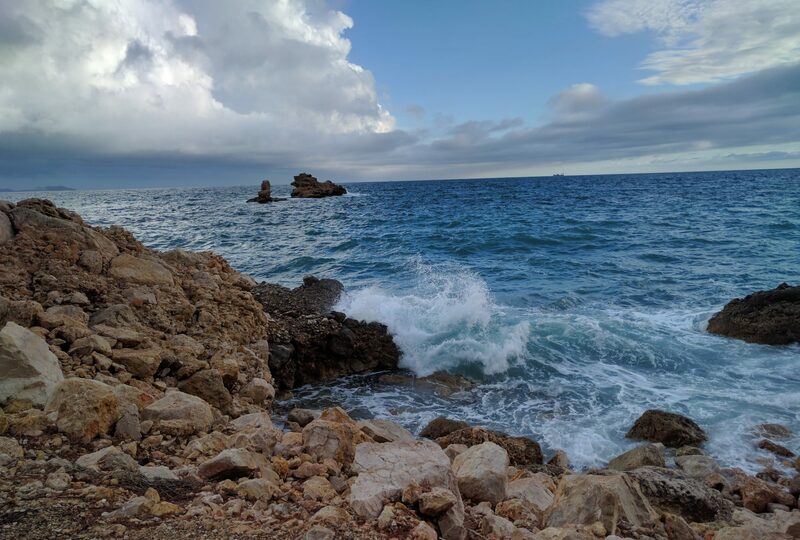 What do we learn from Nabal? Nabal is a picture of the sinner who goes on rejecting God without regard to God’s coming judgment. It is certain that God will judge the sinner who continues to reject Him in His timing. David did not need to avenge himself with his own hand; God was more than able to do it. Jesus may have had Nabal in mind when He taught the Parable of the Rich Fool (Luke 12:15-21). That parable describes a man who dies with everything – and nothing. Wasn’t David already married when he marries Abigail? No. David was not married to Michal because Saul had taken her away and given her to another man to spite David (David will get Michal back in 2 Samuel 3:13-16). David never followed God’s will in his marriage life, causing him some of his greatest trials. Although God did not forbid multiple wives, it is not God’s ideal for men and women and His plan for oneness. David had many passions, one of them being women. He was never blessed by God because, in this respect, he was not a man after God’s own heart. Verse 25 tells us that the author is David in his older years, giving wisdom in the pattern of a song. 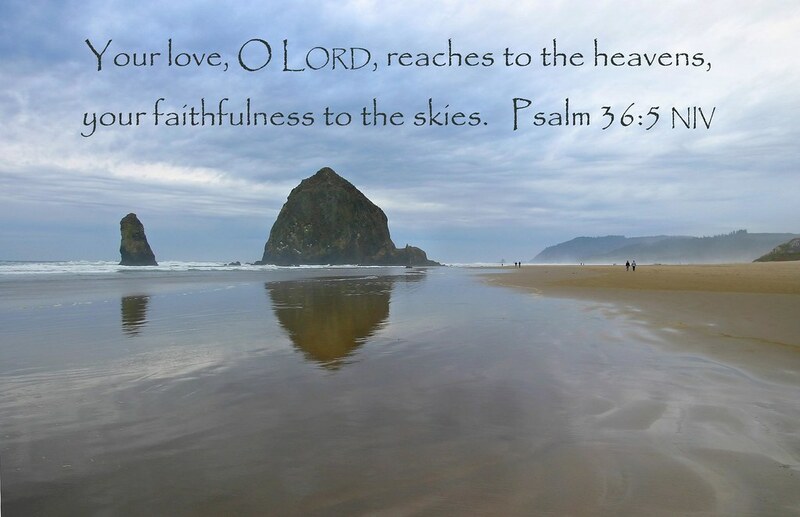 This Psalm is roughly acrostic in arrangement with the lines arranged with Hebrew sentences that begin with the successive letters of the Hebrew alphabet. 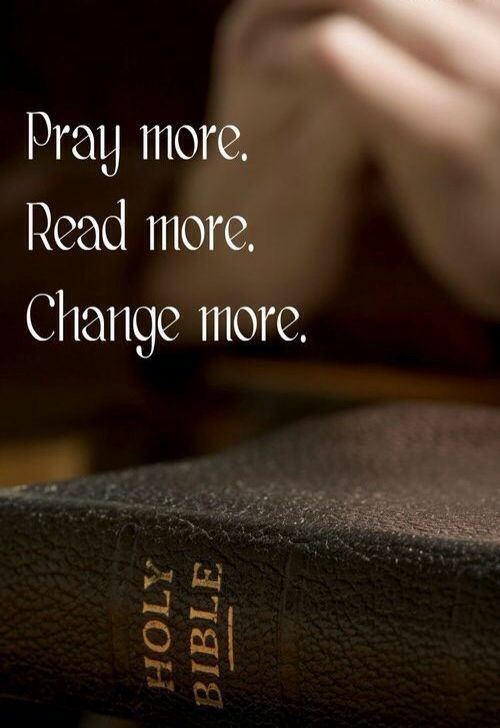 In style this is a wisdom psalm, directed not to man but to God, teaching after the manner of the Book of Proverbs. David gives the same answer Asaph came to in Psalm 73: any prosperity experienced by the workers of iniquity was only temporary. We think of a wicked man eating a magnificent dinner while a godly man goes hungry. The wicked man eats anything and everything he wants, and his table is loaded as he enjoys his meal. Then we see the bigger picture: he eats his last meal on death row and in a moment will face terrible judgment. How do we not worry about what evildoers are doing? Trust God and do good for His glory. We can get distracted by looking at the prosperity of the wicked. Enjoy the blessings God has given you. All evildoers shall be cut off, and the blessed shall inherit the world. Why do the wicked plot against the just? The wicked gnash their teeth, which shows the depth of their anger and hatred. The wicked will be broken; the righteous will be held by God. The wicked take; the righteous give. The promise of earth-inheritance is repeated a three times. How are the righteous rewarded? God delights in us (Romans 5:1-2). As we seek the Lord and delight in Him, we find our lives are the perfect will of God (Romans 12:1-2). “Geber is the original word for good, and it properly signifies a strong man, a conqueror or hero; and it appears to be used here to show that even the most powerful must be supported by the Lord. This was David’s testimony after many years. He saw God’s faithfulness to His people and wanted a younger generation to also trust in Him, learning from David’s wisdom. David knew that among his ancestors were some who left Israel, fearful in a time of famine (Ruth 1). When they returned after several disastrous years in Moab, they found the people of Bethlehem in Israel provided for. God knew how to take care of those who trusted in Him in times of famine, and has done so since then. One way that God provides for the righteous and their descendants is through the ethic of hard work that belongs to the redeemed, who know that all things should be done heartily, as unto the LORD – including working for a living. Do Godly men and women have to beg? This Psalm is a wisdom psalm very much like Proverbs. In the Bible’s wisdom literature often times general principles are presented in the absolute. We also note that David simply wrote of his experience. That being said, God provides no matter what and one must ask if you are begging, are your exercising every option available to you. God’s judgments descend to posterity, not just His mercies. We see the repetition of the same promise in the same terms throughout verses 9, 11, 22, 29, 34. This is a reference to the new heavens and the new earth of Isaiah 66:17; 2 Peter 3:13. What character traits do the righteous possess? FUN FACT: For the fifth time in this Psalm, David promised the people of God that they would inherit the land. For the sixth time in this Psalm, David promised that the wicked would be cut off or cut down in some sense. Their coming doom was just as certain as the coming blessing and security of the righteous. Final thought from David: Trust in God.